00:29 sofar cinema mod? what would that do? 00:32 VanessaE definitely something long into the future. 00:35 sofar it's not anywhere near on the priority list for anyone. 00:36 Asad3ainJalou I used to run a modded MC server and that was a pain, the way mintest does modding is so much better. 00:40 Asad3ainJalou could the streaming be done by calling a lightweight browser or video player ont he clientend? 00:41 Asad3ainJalou say surf from suckless.org and mplayer or mpv? 00:50 Asad3ainJalou sofar: as a computer security major, i subscribe to said tinfoil hat argument. 00:51 sofar writing a secondary implementation makes two unsecure implementations, not one good one. 00:52 sofar was kicked by ShadowBot: Message flood detected. 00:53 sofar ask VanessaE what happens when you give me ideas. 00:53 sofar rendering youtube to wool. hmmm. 00:56 Asad3ainJalou im trying to convince a former minecraft modder friend, Abrarsyed to switch to MT. 01:14 Markow When will version 4.14 be released (ETA)? Thanks. 01:15 sofar maybe 3 weeks from now? 01:26 blaaaaargh 4.14? we're not even at 1.0! 01:28 Markow ...you know what I mean! 01:28 Markow preceding "0" ! 01:30 Markow On the 'railnet' mod, is there any "estimated" time when one will be able to sit in a minecart first, then launch it w/o having to quickly push it and jump inside of it? 03:29 VanessaE I tend to agree. 03:57 sofar in the bucket? 03:59 VanessaE tricks MT could possibly do? 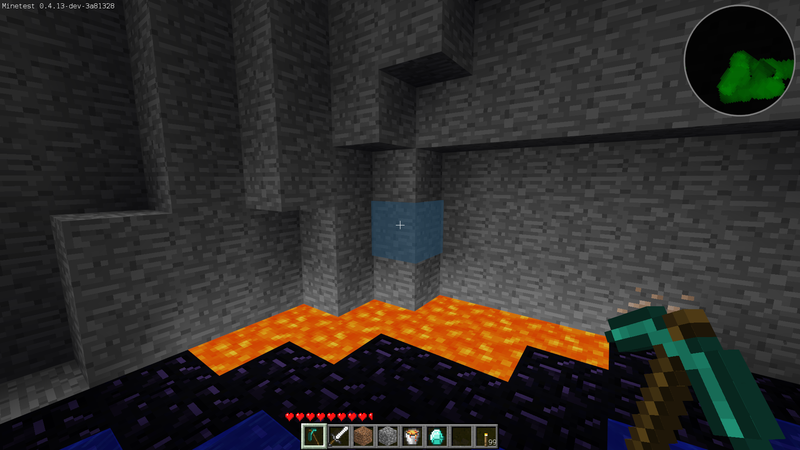 04:04 VanessaE you meant "MC has a fluid biome..." right? 04:05 VanessaE could mT be made to do that? 04:06 VanessaE it would make HDX a ....bit of a pain.... though. 04:58 VanessaE oh wait, that's "all glory to..."
05:29 YuGiOhJCJ hello, I am looking carefully to the content of the "auth.txt" file and it seems that there are two kinds of passwords stored. Some are encrypted with sha1 then encoded with base64 but the other kind I don't know how it is produced. Any help please? 05:49 YuGiOhJCJ oh yeah I see there are two authentication mechanisms: the legacy based on SHA1 and the new based on SHA256. It means that in order to verify the nickname + password, I need to support each mechanism. 08:37 Markow I'd like to compile Minetest (latest version from GIT) on openSUSE Linux. One issue, in the repository, there is no libirrlicht package. 10:29 Preuk Markow: https://build.opensuse.org/package/show/games/irrlicht might help? 10:30 Markow I'll take a look thanks. Otherwise, right now I downloaded the entire Irr Licht Engine source code from their website which includes the lib directory from which I could extract it. 10:48 Markow Haha..the lib files in the Irr Licht sdk for Linux don't come precompiled. So, I'm doing now myself. Just to clarifhy, I need the "shared" lib file, right? Not the "static". 11:14 Markow Still a mystery why SUSE doesn't have these packages...but what the hell! 12:04 Preuk can't test it right now, but what exactly does happen on recipe conflict? 13:06 Preuk until Ms puts a stop to all of it like "hey ! MC is now .NET with paying mod shop !" 13:09 Preuk est31: or just "you can mod it without having to decompile/deobfuscate/inject your code somehow/compile/obfuscate"
13:10 est31 Preuk, isn't there an actual modding API now? or do you still have to hack it that way? 13:14 Preuk what is xonotic? 13:31 Calinou why do you use Avast? 13:34 est31 rubenwardy, interesting video you shared, at one point in technological development we will need socialism, there is no other way except banning automation or letting people starve in the streets. 13:34 Preuk except "funny stuff" today could just be "browse reddit with firefox"
13:53 Fixer or "Star of the Communism"
13:53 Preuk take any chinese restaurant name and replace one of the words with "Lenin" ? 13:54 Fixer village "Lenin First"
13:55 Fixer "Memory of Lenin"
13:55 Fixer hi, where are you from? I from "Memory of lenin"
13:56 Fixer village "Social competition"
13:57 Fixer "Path of the unmarried"
14:41 rubenwardy Are you in creative mod? 14:41 rubenwardy what are you doing? 14:42 rubenwardy What OS do you use, and what MT version? 14:42 rubenwardy Can you try the latest dev of Minetest and see if that helps? 15:23 germanuel24 Does anyone know if the server loads objects also into memory that are in an unloaded mapblock? Like will clearing objects regularly make the server faster? 15:25 germanuel24 Or another question: Do objects remain after server shutdown? 15:35 AnotherBrick it's definetely linking error, but why? 15:36 AnotherBrick ARNING: Target "minetest" requests linking to directory "/usr/lib64/irrlicht". Targets may link only to libraries. CMake is dropping the item. 15:36 Markow When I see this, :WARNING: Target "minetest" requests linking to directory "/usr/lib64/irrlicht". Targets may link only to libraries. CMake is dropping the item.". How do I fix this. What "target"? 15:36 Markow So where do I set a "target" prior to compilation? 15:37 AnotherBrick try to set irrlight.dll or how does it called..
15:37 Markow I'm on Linux, no "dll"
15:38 AnotherBrick what is your IRRLIGHT_LIBRARY variable in CMake? 15:39 Markow and not the directory itself? 15:40 Markow That probably bust my entire make process, eh? 15:41 Markow yes, will do everything now~! 15:45 Preuk so my question was: what are the "good practices" for formspecs? 15:46 Markow Beautiful, worked! No more warnings...now for my "make"!!! 15:47 Markow Do you think those warnings affected my previous 'make' and bombed out? 15:49 Markow It's the 'graphics engine', right? 15:52 Markow I want that binary! 16:02 AnotherBrick sooo it does work? 16:04 Markow I guess it's safe to say, this is very close to 0.4.14, right? 16:04 Markow Should I first allow creative mode, or not? 16:08 AnotherBrick did you selected "Client" tab? 16:09 AnotherBrick and checked "public servers" checkbox? 16:09 Markow Ah, right, "client"! 16:10 AnotherBrick like, "wow, blazingly fast" or "booo, blocks should be smaller"
16:10 Markow Just alone from the way the GUI popped up, and the cloud movement, it's fast! 16:11 Markow What "mapgen" should I use? 16:12 Markow How come it says "Minimal Development Test" under v6? 16:13 Markow Not on this form, perhaps on the previous menu? 16:14 AnotherBrick isn't there listbox containing "minetest" and "min dev test" ? 16:16 Markow let me restart? 16:18 AnotherBrick did you places minetest_game into minetest/games dir? 16:19 Markow damn, I didn't! 16:20 Markow I overlooked it because I did it quickly! 16:20 Markow I'll do it all over again! 16:21 Markow Took me overall, about 4 hours? 16:33 Markow The first Unix based distro which got my feet wet with Linux was FreeBSD. I learned the basics there, then I became hooked, and hungry for more. 16:39 H-H-H what sytem are you building on? 16:41 Markow make finished, no errors, time to start! 16:44 Markow Wow, very nice map! 16:45 AnotherBrick does vanilla minetest_game have mobs? 16:46 Markow What's the inventory key? 16:49 AnotherBrick how do you change weapons when your fingers sit on arrows? 16:51 sofar I change "i" to "e" for inventory myself, but should really be using "tab"
16:59 Markow This is awesome. I'm going to play around with it and make some tea. Thanks again all. bbl! 17:11 AnotherBrick isn't it possible to make compilation process easier? 17:55 rubenwardy AnotherBrick, what OS? 18:00 AnotherBrick i'll do it right now! 18:02 AnotherBrick same crazy stone desert. i should update probably. or change something in config? 18:04 ssieb AnotherBrick: you have a recent dev minetest? 18:10 ssieb oh, definitely a problem! 18:18 ssieb haha, I assume you just tried out the new version? 18:20 AnotherBrick biomes! it has biomes!! 18:21 ssieb you got latest minetest_game as well? 18:22 ssieb do you have the crash log output? 18:28 ssieb how do you turn that into a line number? 18:28 AnotherBrick default value for enable_mapgen_debug_info is false? 18:29 ssieb is that windows? 18:29 AnotherBrick that's what i thought! 18:32 AnotherBrick fallen trees with mushrooms how cuute! 20:23 WookieWarlock Erh, how's it goin'? 22:08 STHGOM what is the mod with good looking/actiong npcs?